A Scandinavian sibling adventure combining the Danish capital Copenhagen and Sweden's third largest city Malmo. FOR THE BEST HOT DOGS . . .
you must pay a visit to Andersen Bakery. Their famed 'bulldog' totally hits the spot. *Update - the branch we visited opposite the central station closed in Summer 2017 but there is a new outpost in Islands Brygge harbour area! Andersen Bakery, Thorshavnsgade 26, 2300, Kobenhavn S, Denmark. FOR THE DREAMIEST OF JEWELLERY DESIGNS . . .
Local jewellery designer Charlotte Othmar has a boutique a couple of streets away from Nyhavn and it's definitely worth swinging by if you fancy picking up a keepsake from your travels. The good news if you can't take a trip anytime soon is that the online site is easy to shop and has some really unique pieces at surprisingly affordable prices. Othmar, Kongensgade 5, 1264 Kobenhavn K, Denmark. FOR SMORREBROD AND SCHNAPPS . . . In the 18th Century this was where the farmers and charcoal burners came after market to enjoy some Danish hospitality and to this day it remains one of the most authentic places in the city to enjoy traditional open sandwiches 'smorrebrod' and schnapps. As you take the steps down from street level you are transported back in time. The old fashioned surroundings with nostalgic wooden beams and tall oak panels, delicious food and an endless variety of over 140 specially selected (refillable) schnapps make Schonnemann's the most quaint and charming lunch destination to while away a couple of hours. As the menu suggests 'you may feel somewhat lighter and animated when you again rise from the cellar and up into the sun and light on Hauser Plads'. FOR ENDLESS STREET FOOD STALLS . . .
A collective of 60+ vendors offering street food and drinks with influences from just about every corner of the globe. Copenhagen Street Food is housed in an old quayside warehouse which used to store paper for the Danish Press Association, hence the nickname Paper Island. It's advisable to make a few laps to peruse what's on offer before trying to make a decision, the choices are endless! Once you've queued for your feast you can find a seat at one of the many candlelit dining tables or around the fire pit. Opening is seasonal so check before visiting. Hall 7 & 8, Paper Island, 14 Trangravsveg, DK - 1436, Copenhagen. FOR A PRICKLY SOUVENIR . . .
A concept store dedicated to cactus and succulents with a Nordic feel. Also purveyors of handmade ceramics, art, hammocks and a selection of pots. FOR THE BEST HOT CHOCOLATE . .
Just try and resist the aroma as as you walk past the door of this little chocolatier! FOR COCKTAILS IN AN OLD PHARMACY . . It took a bit of hunting to find the entrance but it's worth the effort for stylish Scandi interiors and a great drinks list. FOR PRE DINNER DRINKS . . The oldest spot on the Meatpacking district, Pate Pate is a buzzy meeting place with lots of character where candles flicker invitingly from within. With over 30 wines by the glass it's a great place to stop for a drink at the bar before dinner. I haven't sampled the food here but it's reputation is very good and the group who own this place also have many other establishments around town, check the website for details. FOR POCKET FRIENDLY PIZZA . . If you find yourself hard up after spending all of your krone on an impulse interiors purchase then fear not, you do not have to go hungry. Mother serves up really good pizza that wont break the bank in a hip, laid back setting. FOR FISH SUPPER . . If fish be your favourite dish, head to this industrial style restaurant. The menu at Kodbyens Fiskebar changes daily depending on the catch from the local waters and vegetables are seasonal and organic. A healthy choice after one too many Danish pastries. FOR HIGH STREET HITS WITH A SCANDI EDGE . .
Denmark's answer to Zara, Moss Copenhagen is the one stop shop for on trend affordable fashion. Basics and classics done really well, I'm a huge fan of their simple style. FOR THE BEST EVER CHAI LATTE . .
Thankfully I discovered Lagkagehuset early on in our trip so we managed to squeeze in many chai's during our weekend of exploring. I'm not even sure how they make it taste so good because I spied the generic branded Drink Me Chai powder that you can find in supermarkets, but trust me it's the most delicious, creamy cup of comfort going. 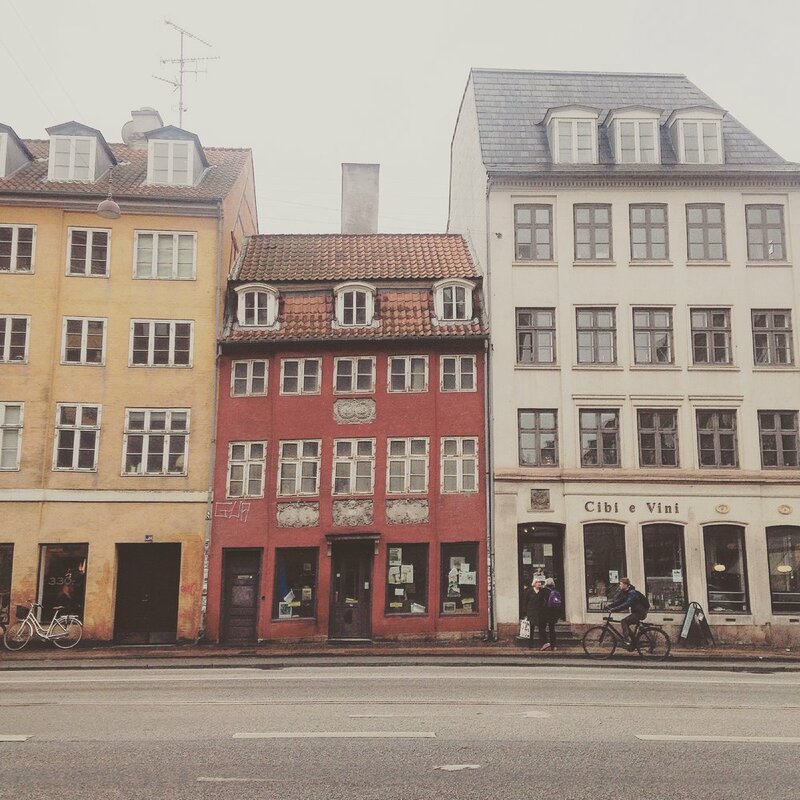 You can barely walk two blocks before passing a Lagkaghehuset in Copenhagen, they are everywhere, which is both a blessing and a curse as their pastries are incredible too and not forgetting the mini sausages baked into cosy little bread blankets, I feel a craving coming on. You can make a day trip to Malmo from Copenhagen Central station with a journey time of around 25 minutes. FOR TRADITIONAL SWEDISH FAYRE . .
You can't visit Sweden without having meatballs and in Malmo, old school dining room Bullen is the go to place. FOR FIKA AND HOMEWARES . . . The opening of this concept store was impeccably timed with our visit and boy did we love it! Fusing home interiors and fashion in raw, organic fabrics, vintage furniture, plants and a cafe, AB Smaland can be likened to Anthropologie. The layout of the store is a little like wandering the different rooms of a house, perfectly curated for the curious customer, there are treasures to be found around every corner. The vision was to create an inspiring meeting place with a creative atmosphere where everyone feels welcome, I think they got it just right.